Éclairs do not need any introduction, do they? Everyone of us (except for vegetarians/vegans from birth) must have had éclairs atleast once in their lives. My take on éclairs came from a friend buying an éclair at some bakery shop while finding it too hard to even bite and the plain whipping cream being too thick and stiff to eat. We tend to think good food needs much effort to make but éclairs have nothing difficult about them! 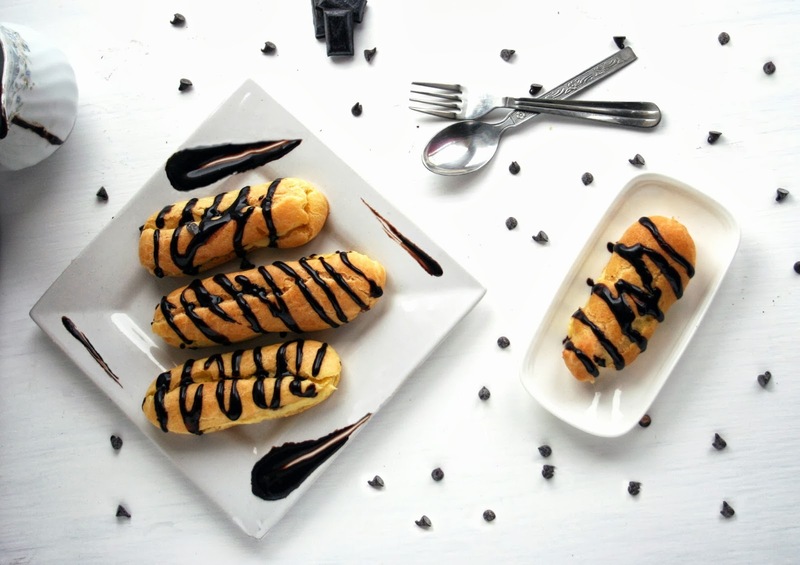 Make a choux pastry, a Crème Patissière and a chocolate ganache - 3 easy straight forward steps to follow and you get to enjoy homemade Éclairs! Bring the water, sugar and butter to a slow boil in a pan until frothy. Add the flour to pan and stir with a wooden spoon until a soft ball forms; this shouldn't take longer than 30 seconds! Turn of the heat and remove pan from the stove. Give the mixture a few strokes with the wooden spoon to allow slight cooling. Add the eggs one at a time, mixing vigorously to obtain a smooth and homogenous batter. Spoon the batter into a piping bag fitted with a wilton 1A tip or a just cut the end with a 2cm diameter. On the baking sheet, pipe out oblong shapes, about 3-3½ inches long. Let bake for 8-10 minutes and then reduce the temperature to 180˚C. Bake the until golden brown or for another 20-25 minutes. Turn the oven off and allow the choux pastry to rest in the oven for 5-10 minutes. Cut open the pastries on one side, to let trapped steam off and allow complete cooling on a wire rack. Meanwhile, make the filling - the Crème Patissière. Combine the egg yolks and the sugar. Using a whisk, whip until pale. Add corn flour and flour and mix well. In a pan bring milk and vanilla essence to a boil. Little by little add the milk to the egg mixture, making sure you whisk simultaneously and quickly so as to prevent any eggs from cooking. Pour the mixture back into the pan on medium low heat and whisk until mixture thickens up. Allow cooling. Cover with plastic wrap to prevent any lump from forming. Mix whipped cream with the pastry cream and transfer into a piping bag. 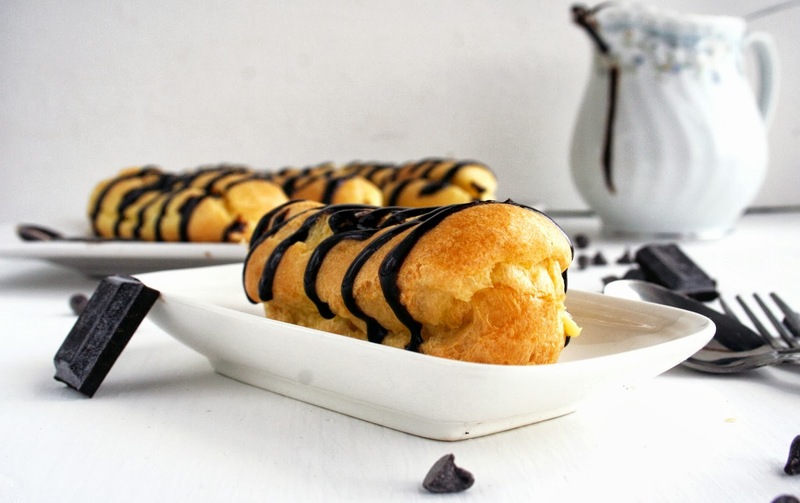 Fill the choux pastries with enough Crème Patissière. In a saucepan, bring the whipping cream to a soft boil. Remove the saucepan from the heat and toss in the baking chocolate. Using a whisk, combine the cream with the chocolate until smooth. Let cool slightly. and drizzle over the Éclairs or dip them into the chocolate ganache! Delectable Chocolate Éclairs with Vanilla Pastry Cream Filling. And you're done! A few steps but nothing too hard!